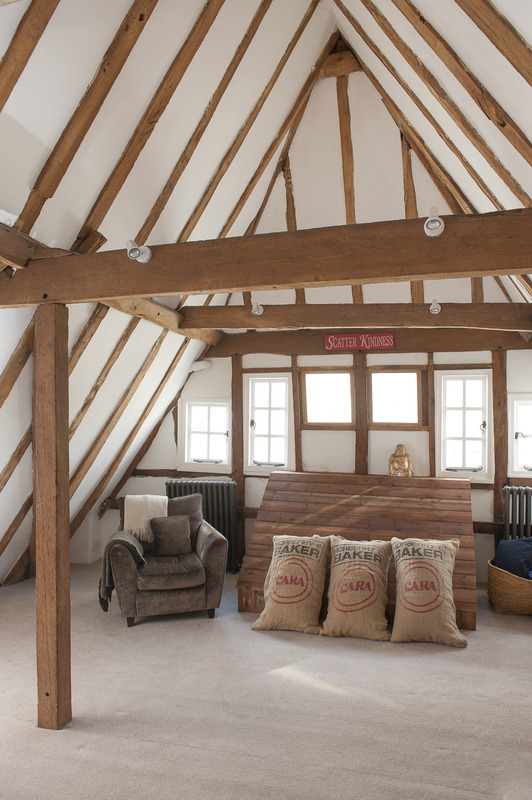 Blending soaring ceilings with middle-eastern furniture finds, the success of Lorraine Kerr’s barn conversion lies in her ability to inject a little quirkiness into a traditional, beamed interior to create a stunning family home. Interiors that are designed without compromise by one individual are always interesting and often considerably more than interesting. 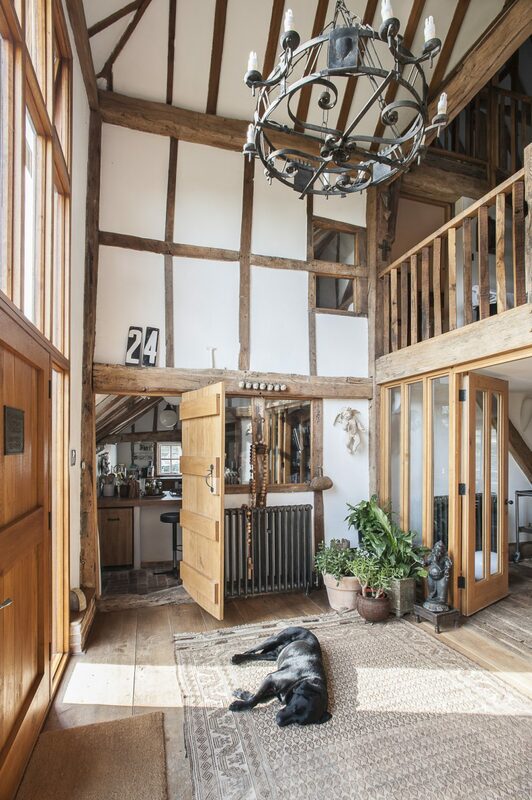 Lorraine Kerr’s period barn is just such an interior. After she and her husband separated, she was left with a truly wonderful space and no one to please but herself. The result is that she has pleased not only herself but anyone lucky enough to cross the threshold. 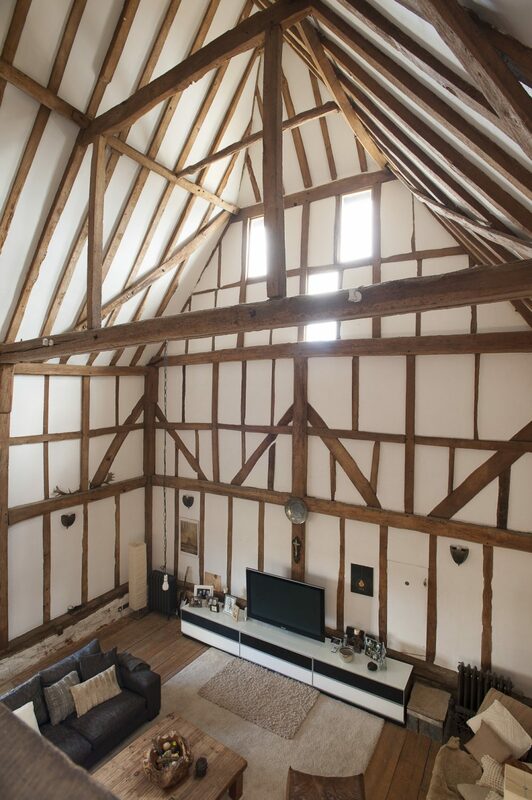 To begin with, this is a serious beast of a barn that also incorporates a square oast, so the space and possibilities were considerable. 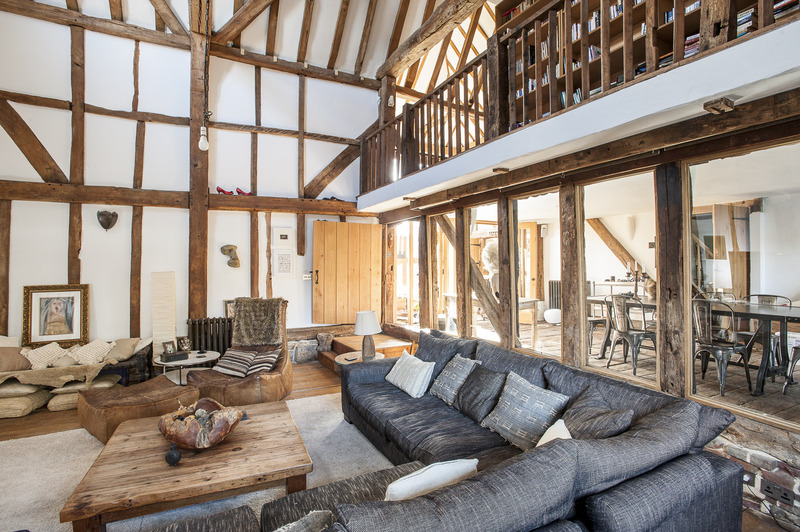 The timbers are terrific, ranging from delicate exposed stud walls to massive structural beams. When she took over the property a huge amount of great work had already been done by its previous owner. 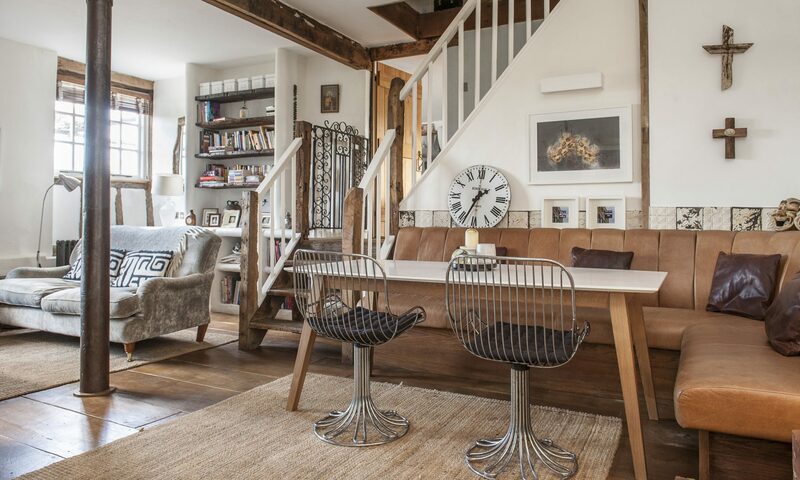 Her challenge was to take over the taming of this wonderful monster of a building and make from it a stylish but warm and welcoming family home. 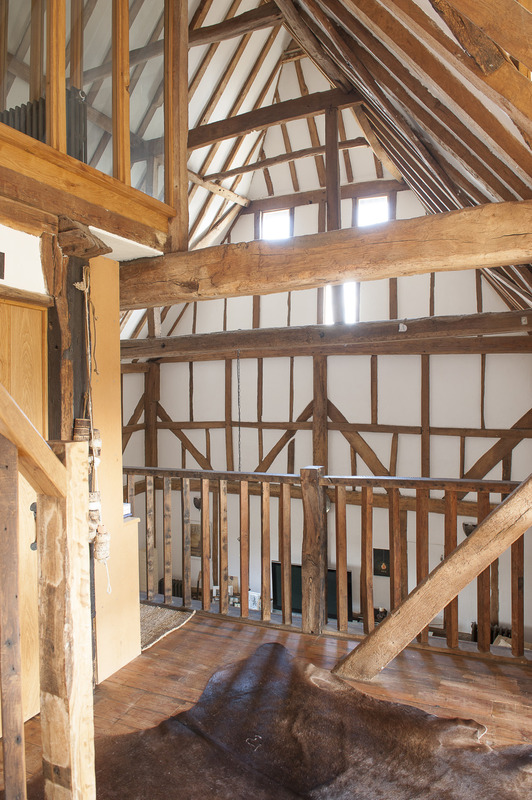 With the superb timberwork one of the great features of the building, Lorraine decided that it should be placed centre-stage by painting every wall and ceiling white. Mood would be set by furnishings, furniture and personal possessions. 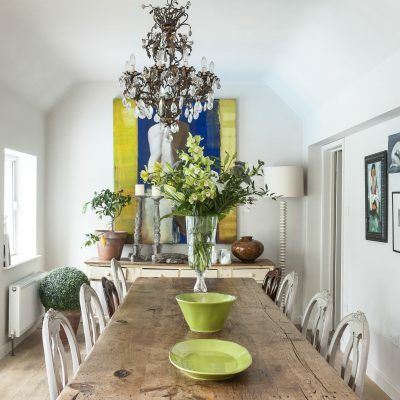 “I wasn’t looking to create some wonderful show home that would merely be admired – I like a home to look lived in and perhaps a little quirky,” she says. By its nature the house would demand certain compromises and one was the kitchen. These days the trend is for kitchens the size of Belgium that serve as a central gathering place for family and guests. 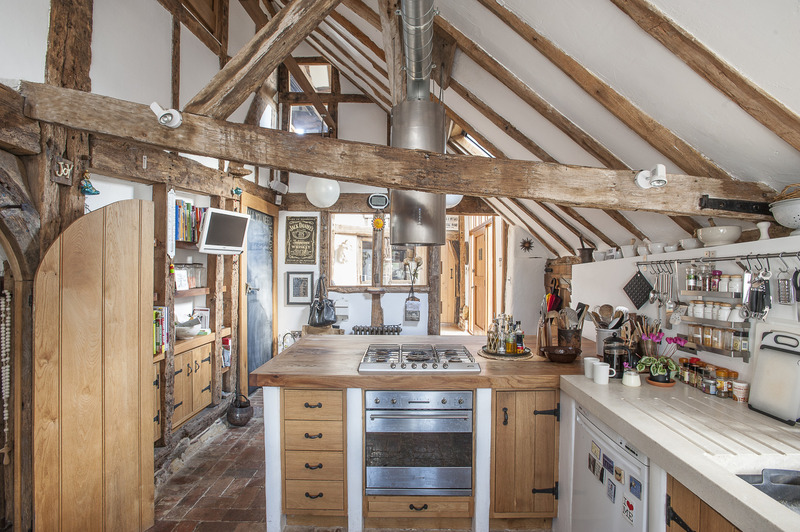 The space Lorraine had for her own kitchen was more modest but she knew that it would still be somewhere where people would gather to talk while she prepared drinks or meals and so she divided the room roughly into two with a yew-topped breakfast bar in which there is also a hob. 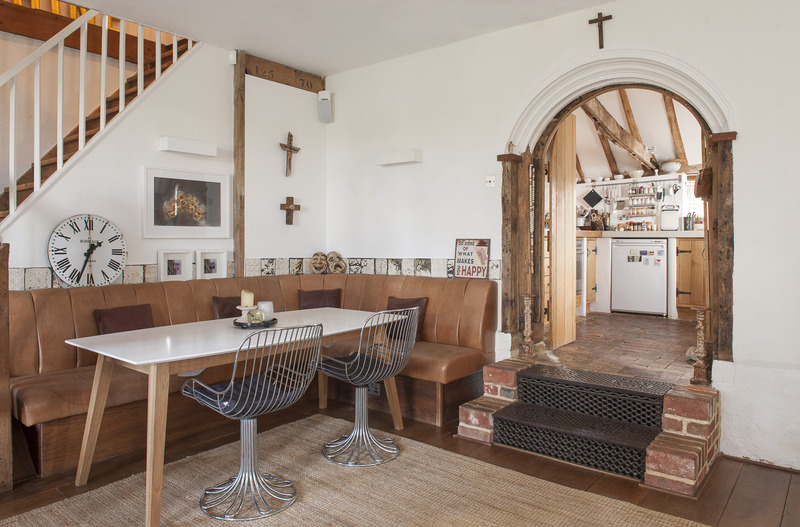 Next door, through a doorway topped by a wonderful arch made from half the base of the original cowl of the oast, is a family/breakfast room divided by a structural beam supported by one of the cast iron pillars that once held up a roof in Tenterden’s Victorian railway station. 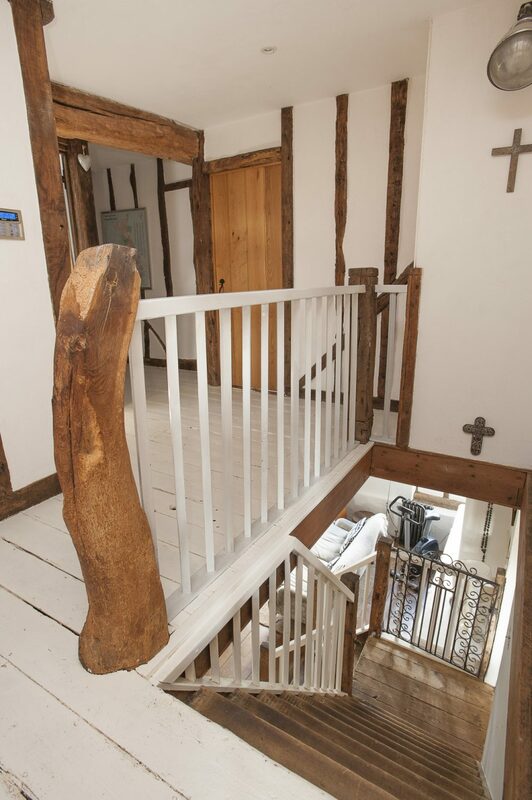 “When I first saw the room the beam was supported by a brick pillar but I saw this old cast iron pillar in Authentic Reclamation Stonegate. 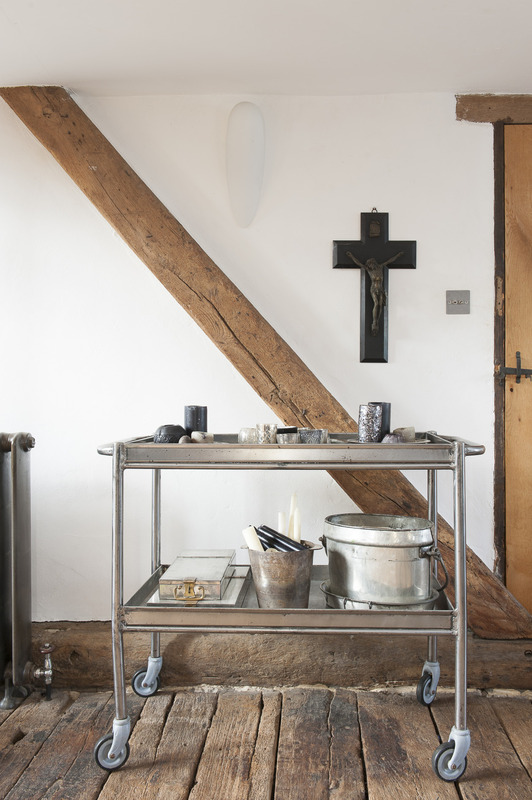 I had it blasted and lacquered and it looks great,” says Lorraine. 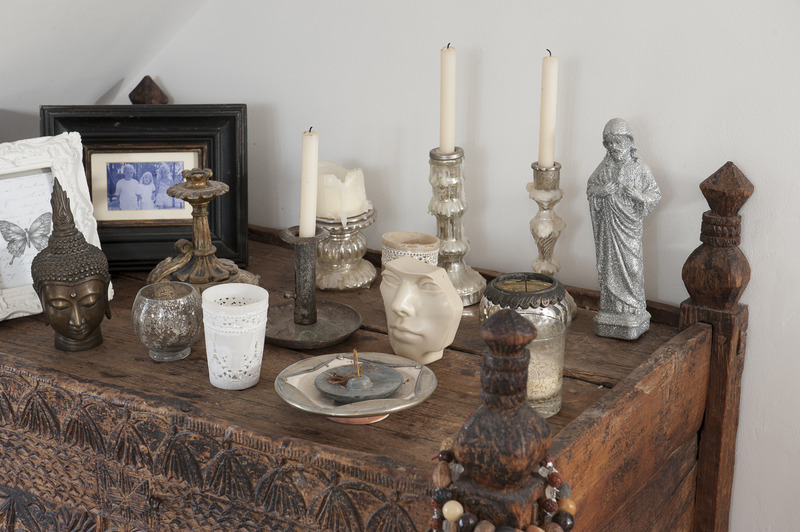 The result is that, throughout the house, one comes across all manner of lovely antique crucifixes. This may perhaps sound a little strange but they work surprisingly well as merely pieces of art in the quasi-ecclesiastical vaulted interiors. 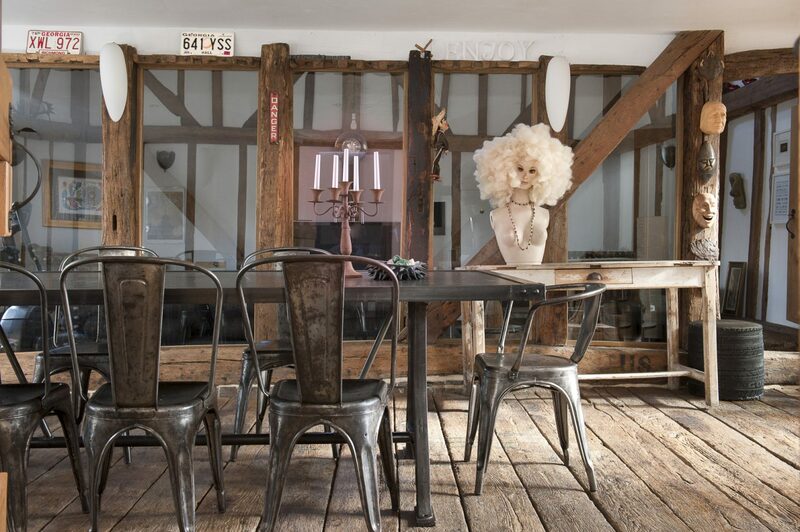 The family room leads through into the heavily timbered dining room where stands a truly spectacular industrial steel dining table and chairs, made from reclaimed metal by Le Grenier in Lille. Next to it, in complete contrast is an old stable manger. The wall between the dining room and drawing room is glazed open studwork. 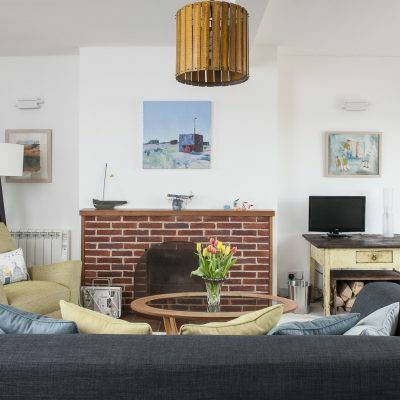 “Originally, it was just open studwork and while I like the idea I also wanted the feel of two separate rooms so it was the obvious solution,” she says. 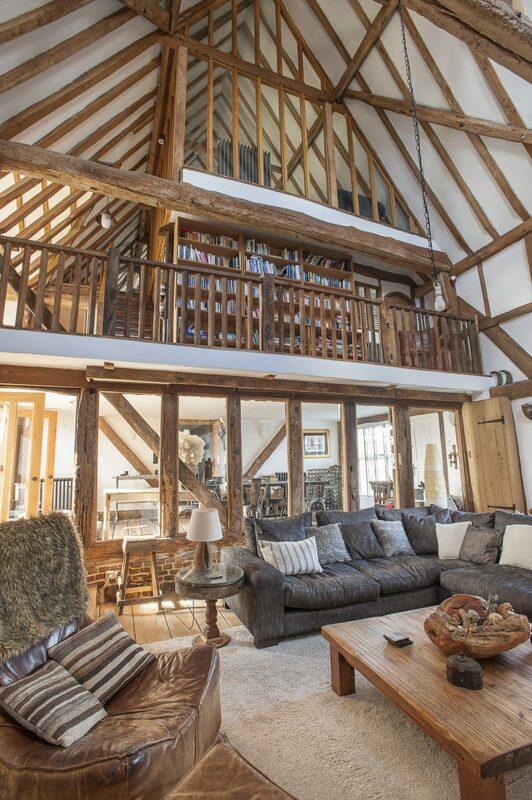 The drawing room is one of the most impressive barn rooms I have ever seen. Soaring up through the first floor and its gallery and then up again into a vaulted ceiling, it almost has you reaching instinctively for a hymnal. A touch of a button has blackout blinds made by Bell House in Cranbrook descending between the studwork separating drawing room and dining room. The big L-shape of sofas is in charcoal. 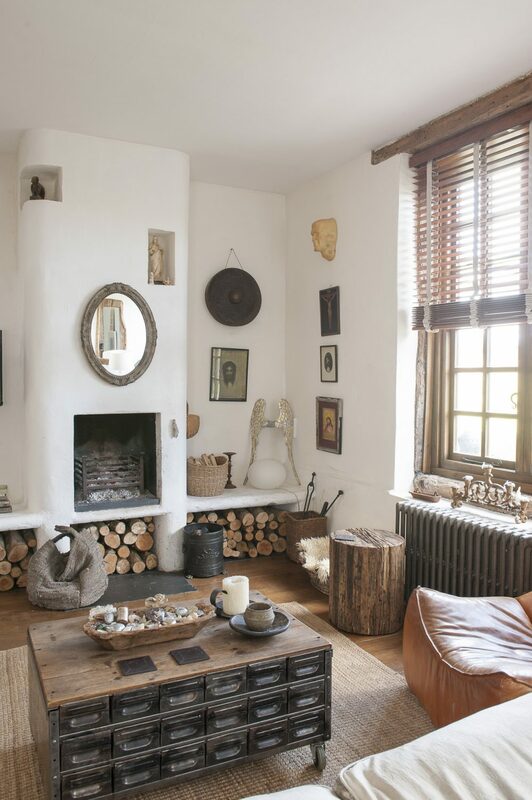 “I like neutral palettes rather than bright colours,” says Lorraine. On the opposite side of the room is a seriously contemporary audio-visual set up – a 52-inch TV on a long, low, black and white cabinet which houses the stereo speakers, DVDs and ancillary kit. The central oak coffee table was made by her brother-in-law and high on a beam are a pair of obviously magical, red and sparkly Wizard of Oz shoes. In one corner is an Afghan charpoy and in another the bust of a lady in a bright curly blonde wig. “When I got her she was bald so I had to do something about that,” she says. Lorraine’s louvre-windowed bedroom is in the base of the oast and here are other Afghan finds – a carved cabinet and two carved doors that now form a headboard. 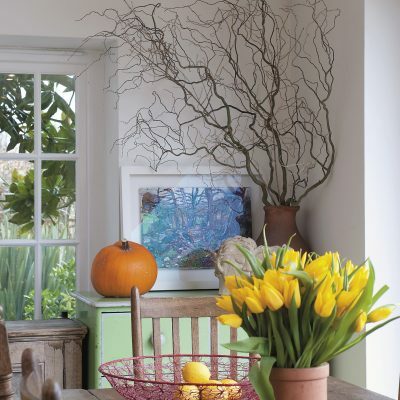 French windows lead out into the garden, flooding the room with light and providing a great view of her pond. Above the bedroom is an elegant galleried dressing room with wall-to-wall mirrored cupboards and off it an equally elegant wet room. 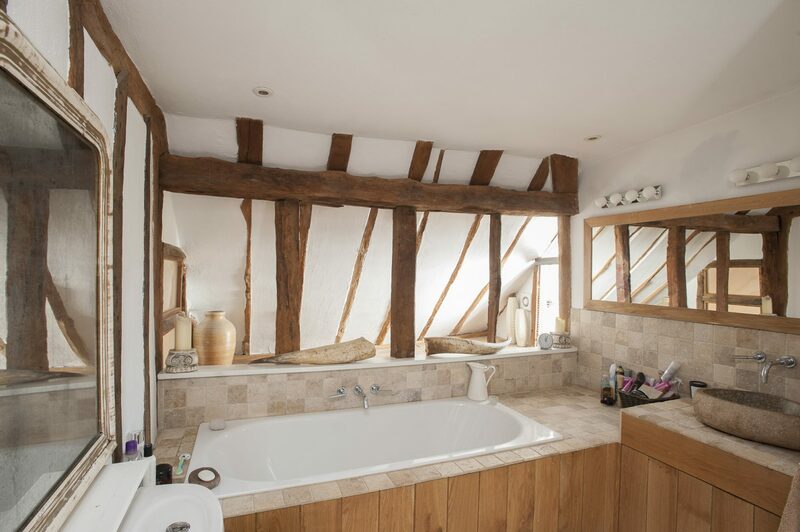 The family bathroom is a balance of contemporary and period – plenty of timbers and complementary woodwork but also items like a great Fired Earth hand basin carved from a single piece of stone. On the first floor are the rooms of her son and her elder daughter Abby. 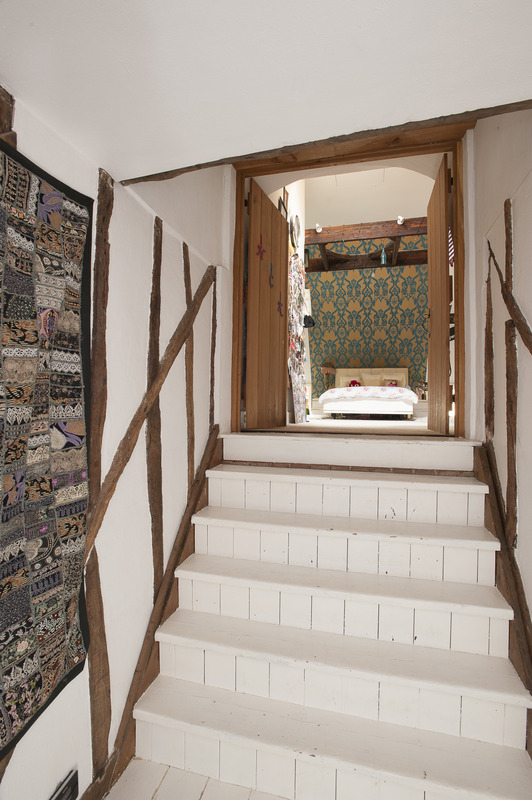 Up a pretty white painted staircase to the second floor is daughter Holly’s room. 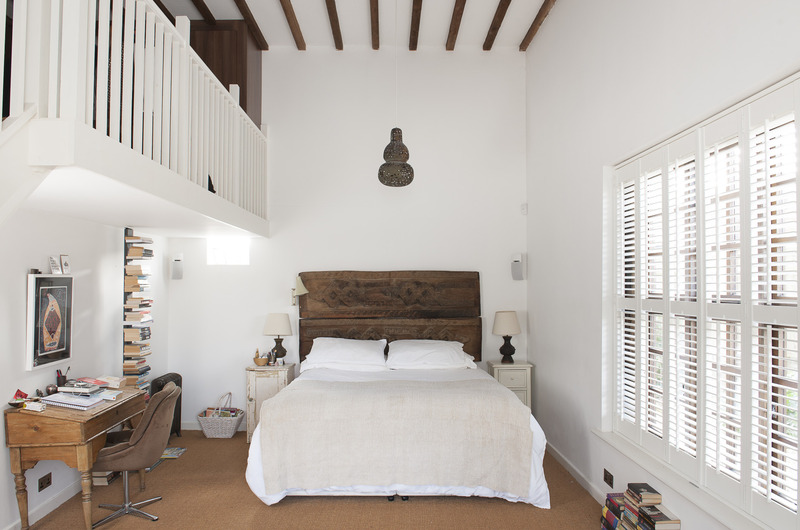 Above the bed, Lorraine has papered the vaulted wall in Designers Guild Bergamasque Turquoise from Bell House to give it the suggestion of a canopy. Holly’s TV swivels on the end of a pole suspended from a beam to allow her to watch it both from her desk on one side of the room or from her bed on the other. 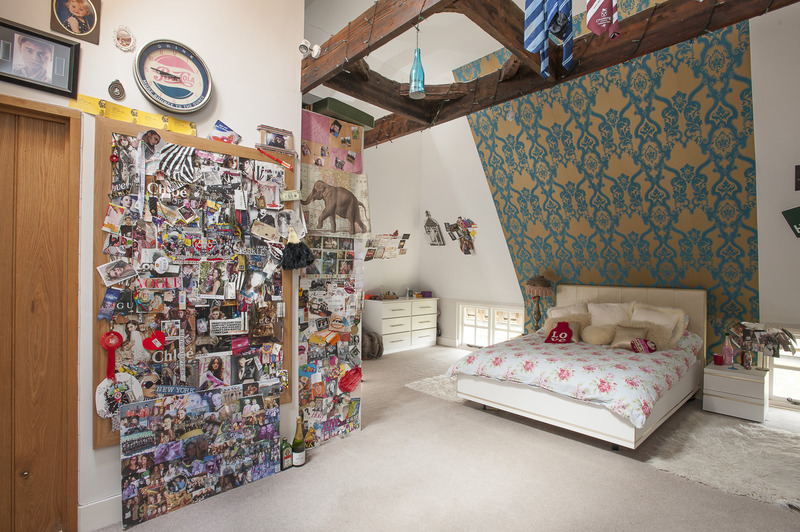 On the same floor is the ‘crash room’ which used to be used largely by the children’s friends for sleepovers and which has a dramatic glazed open studwork wall which overlooks the drawing room. This is a great example of what can be achieved by a single mind with a single vision. It is exactly what Lorraine hoped it would be – elegant, interesting, true to its architectural roots and a warm and inviting family home. 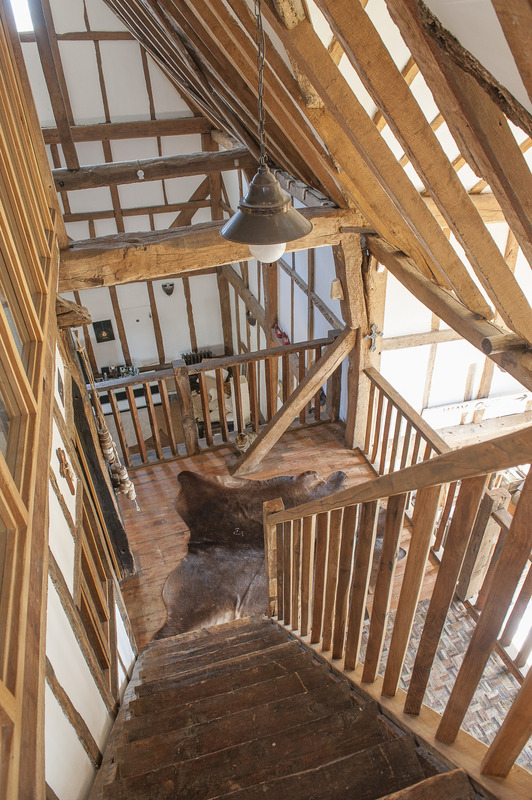 At the top of the barn, reached by its own staircase, is the ‘crash room’ which used to be used largely by the children’s friends for sleepovers and which has a dramatic glazed open studwork wall which overlooks the drawing room.